My school uses Scott Foresman Reading Street. When I moved from the computer lab to teaching first grade I was SO overwhelmed with all of the Reading Street materials! There are like a bazillion worksheets! Grammar worksheet, spelling worksheets, workbook pages, etc. There is just so much “stuff!” My first year I tried to fit in as much as I could. Obviously, I didn’t fit it all in. Students all start on the same story. Early in the year the stories are so short. During literacy workstation time, I read with as many students as I can, one-on-one. I do not do guided reading groups. I’ve never had much success with guided reading groups. I understand why they could be beneficial. My first year of teaching I was pretty much forced into “do guided reading groups this way or else” and I guess it just turned me off to the whole thing. Working with students one-on-one really allows me to truly “know” where my students are at. I am better prepared for parent conferences because I can narrow in on what each student needs to work on. If a student can read the story with accuracy and good fluency then they pass on to the next story in the series. The cool thing is if a student passes all of the first grade books they are given a second grade book! (A second grade book from our old reading series. We don’t want students reading the second grade stories from Reading Street and then going to second grade and having to read them all over again.) I had several students who made it to a second grade book by the end of the year! 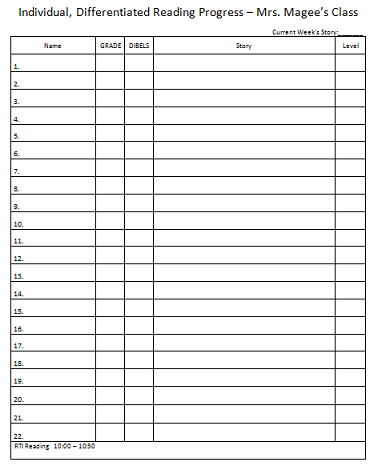 Below is the form I used to keep track of students’ progress. I wrote down their GRADE and DIBELS assessment scores. I wrote down the story they were on. I also made little notes as needed. At the top I wrote what week we would be on if we we WERE doing the stories whole group. That way I could quickly see who was behind, who was on track, and who was ahead. Next year I will use this quick form as well as individual forms for students. I am working on running records for all of the stories in Reading Street. My students were amazing readers this year! Parents helped their child read at home more than parents in the past had. Students were very motivated! They were always asking their friends “What story are you on?” It really encouraged the students that might have been behind to work harder to catch up to their friends. It also challenged my advanced readers because they all tried to pass each other’s stories. Needless to say I will NEVER go back to making all of the students read the same story all week! B-O-R-I-N-G! When we all did the same story together, some kids were lost and some were so bored! It takes time to read with all of the students, one-on-one, but it is so worth it! They would all beg to read with me! The kids loved it. I loved it. I am never going back to my old ways! I’ll be doing Daily 5 next year, and my one-on-one conferences will work perfectly with Daily 5! I know Daily 5 also makes use of strategy groups, and if I need to pull a strategy group here and there I can and will, but most of my time will be spent with one-on-one reading conferences. Wow! You have me thinking….do you use the leveled readers in your one-on-one conferences? Second question, how many students do you meet with on a daily basis? I use the reading textbooks for the one-on-one conferences. So instead of us all reading the same story in the same book all week, students work through the 5 books on their own. I meet with as many students as possible each day! In the beginning of the year, I can meet with many students because the stories are so short. As the stories get longer, I am not able to meet with as many students each day. I did have an aide for about an hour once a week that would also read with the students and my husband came once a week and read with my students as well. I didn’t read with my advanced students as often as my struggling students. I did not use the leveled readers at all this year. However, I’m thinking I might use those in fluency centers somehow next year or make it so that students can put them into their book boxes to read. What “grade” do you give on your assessment form? The “GRADE” next to “DIBELS” is actually a standardized test we use in my district. GRADE stands for some big long thing. It’s a reading test. Students are given a stanine score that makes them either intensive, strategic, or benchmark. I just write I, S, or B there to let me know who was on level, below, or above according to the test. Same with DIBELS (oral reading fluency assessment). Oooh, Now I’m thinking too. I’ve wanted to use Daily 5 again, but had a hard time figuring how I might do that with reading street too. Do you use any of the thematic pieces with the amazing words and questions of the week? How do you teach the comprehension strategies–by the child or by the week with the whole class? I teach with Reading Street. I have found other teachers in my building teach the textbook story all week long, then complain because they have to supplement so much. I try to use as much of my curriculum together as possible because it all ties together. In first grade, my co teacher and I use the level readers as the “meat” of our curriculum and basically supplement with the textbook. For example: I group my students by ability. Low, On level, and Above. I pull each group once sometimes twice a day. During group time we use the decodeable and level readers and then assign them for homework. Then on Thurs. we read the textbook together and they take it home for homework. MON- Low group take home decodeable reader, Onlevel take home SI reader, Advanced take home onlevel reader. Tues-Low SI reader, Onlevel onlevel reader, and Adv advanced reader. Thurs-read level readers in groups, textbooks as a class and take home text for homework. Friday- I use the curriculum Selection test for comprehension and fluency monitor. I also do a HFW sight test. This allows me to teach the same target skills, HFW, Vocabulary, and theme topic because all the level readers are aligned. This also challenges my students to move up in the groups. ON level students work really hard to move into the Adv groups and such. My co-teacher has been using this method for several years. Her comprehension scores are through the roof. She normally has students who test out in 2nd grade or higher. Okay I am loving this! We use RS in my district….and I found that I never have time for my lit units of study…I love your way of doing RS. I love working with students one on one (I guess from my Reading Recovery training) so I love that you do one on one conferences! Thanks for sharing. Where can I find more information about this program? I too, hate having guided reading groups & I would love to know more about this. THANKS. Well…the way I use Scott Foresman isn’t really a program. Scott Foresman Reading Street actually has a guided reading component; I just choose not to use it. I prefer working with students one on one. All this sounds so good! This is my first year of teaching and yes I’m trying to survive it. I have many odds against me. First of all, I came in late (5 weeks) in to a 1st grade class that was managed by a few teachers who one quit 1 week in. I am expected to do Reading Street with alot of small group instruction and I’m finding all this to be quite overwhelming. My high kids are bored and my low kids are extremely low. There are definitely high expectations on my plate. Your idea seems so interesting to me. I don’t get as much in during small group as I would like because the management is still trying to recover. The idea of one to one conferences would be so helpful to me I just don’t know how I would start it. Christmas break is coming and I want to start fresh in January. I even wanted to start Daily 5 but think it might be too much. The management piece is still something I’m trying to correct for this class but I’m finding it very difficult. I would like to start something like this but don’t know how. Any suggestions for all you experts? Your situation does sound difficult and the best advice I can give is just don’t bite off too much at once. Daily 5 is a great management structure but it’s not working as well with my class this year as it did last year. I have a much lower group of students overall so I’m having some struggles myself. I am not required to do small group instruction so I have some flexibility. I do read the story of the week twice a week to the class just to introduce the science/social students connection and to cover the comprehension skill again (I do other activities as my primary comprehension lessons). I do a comprehension assessment too that I get from soundcityreading.com (GREAT site if you haven’t checked it out!). I’m also hoping to start fresh in January as I have a difficult class this year. Best of luck to you and try making a couple of small changes at first. Even small changes can make a big difference! How would you suggest I start the new year (January)? Do you recommend jumping in right into Reading Street or focusing on review? What are your thoughts? This is the first time I wll use reading street 3.1 with 5th graders and I do not know how tu use it or which stories are boring or which skills (author’s pupose, cause and effect,..) can be taught. Do you mean unit 3.1 of the first grade series? If you have the curriculum, the teacher’s guide (and even the student textbooks) tell what the skill for the week is that goes with the story. As for stories being boring, not every student (or teacher) will like every story, but that’s just life. 🙂 As you’re working with 5th graders, what I would do with first graders would be very different. I love you ideas. This will be my first year using reading street and have been really overwhelmed with the content of the series. Thanks to your wonderful ideas I now have a better grasp on what to do for next year. Thanks. Hi! Thanks for sharing. This will be my 4th year in 1st using RS. I know what you mean….we dumped Lady in the Moon this past year, but it makes me extremely nervous to drop everything. yikes. What do you have your other students do while you are doing one-on-one groups? What standard to you use to measure whether they can move on to the next story? What other ways do you get reading grades? Sorry for all the questions. I am very interested though. I don’t drop everything. The students still read the stories, stil do the phonics/spelling skills of the week, still get comprehension lessons, etc. I just don’t make them all do the same story at the same time. While I’m meeting with a student one-on-one the other students did literacy stations last year. This year they will be doing Daily 5. A student can move on to the next story if they can read the story fluently with few mistakes. If they repeatedly miss words that follow our spelling skill or high frequency words I make them keep practicing that story until they can read it more fluently. If they miss a difficult vocabulary word I don’t flip out about that. I am actually working on running records (okay they aren’t true running records because with running records you aren’t supposed to read the same story over and over) for each story to document their reading of each story. In my school, first graders do not get a number grade on anything. They only get S, N, or U so I don’t worry about grades too much. They get spelling grades of course. I take into account their standardized test score and their DIBELS score. Most of my report card is filled out based on teacher observation/anecdotal records. I had a couple of students last year who finished the year in Book 3. Were they on level? Definitely not, due to a number of factors. There’s no way they would be able to read a story in book 5 so I don’t feel it’s right to try and make them read something they aren’t ready for. I had many students who finished all 5 books though and got to go on to second grade material or beyond. I’m really interested in the way you read with your kids. I LOVE reading conferences! I have been doing them in my classroom for the last five years (with very few small groups- except for my intervention children). This year I have a new reading coach. She isn’t happy with first grade teachers because we aren’t pulling groups. She thinks we should be assessing phonics skills (by using running records) then pull flexible groups to teach those skills. I’m having a really hard time even wrapping my brain around doing it that way– especially I know that my way works 🙂 I teach with Harcourt Storytown, but I’m sure it’s set up very much like Reading Street. * All of my kids have book boxes for Read to Self. I know which level books they are able to read because of conferencing. Do you ever read leveled books with your kids, instead of the RS books? If not, how do you know which books are “just right” for their box? *Do you ever teach specific skills with the children, away from whole group lessons? I haven’t been teaching a small group phonics lesson (except with the three children that really struggle), but that’s one of the complaints from our reading coach. She thinks if a child reads a book to me and I notice (from running records)that she is having trouble with short u, I should pull that child and other “short u children” together and have a small group. However, I feel like I can quickly teach the miscues while the child is sitting with me. So, I want to know if you pull students that are having the same phonics issues. Does that make any sense? I’m sorry my question is so long!! The first grade teachers at my school have been super stressed about the changes we are supposed to start making. We are grasping at straws to find a happy medium. LOL! I just read your comments about studying “Lady in the Moon” for a week. For some reason that story never worked for me, the students nor my first grade teaching partner. We’ve dropped it for the past 2 years, but picked up the grammar. The story bores me to tears! This is very interesting how you “tackle” Reading Street. Definitely something I will consider for next year. Wow! This is really interesting. I’m a first year teacher, so I had a rushed explanation on how to teach RS and learned what DIBELS was AFTER the students were benchmarked and progress monitored. Ugh! It’s mid-Feb., and I’m just now beginning to get used to it…and those worksheets! Oh my! The other 1st grade teachers make all the copies, so let’s just say my recycling bin is full each week. We’ll be reading Lady in the Moon this week, and we’ll read it aloud together 4 times (teacher reads, echo, choral, cd). Yuck! I’m really interested in using Daily 5. I’m observing in classes that use it and have been to a workshop on it. As you make plans to integrate RS and Daily 5 together, will you please share more? How do you do your unit tests (if you use them at all? when the students are not in the same units? Wow, thank you so much for all the information!!!!! We are getting familiar with RS, coming from SF, I can’t see me reading one story all week long!! !Like others here,how boring!!!!!!! ….I don’t know how we are going to do it, and I have to get myself off of this negative “vibe” I have about it. Hello, I’ve been sharing your blog with some coworkers as we’re interested in getting our kiddos off reading the same story together each week! I am curious about a couple of things if you could answer for me! First, how do you go about teaching the skills or keep track of who needs work with what skills? The way that we have done things in the past is we use daily 5, test their knowledge of the skills on Friday and then re-teach those who need it the next week- how does this work with teaching and having each of the kids on different stories? Like I said, we are real interested in working something like this and I would love to hear more from you about how you structure your day! THANKS!! First I must say that this coming school year my team and I will have to go back to the more traditional way of using our reading series which means we will be all reading the same story each week. (I will be doing a LOT of supplementing!!!) What I’ve always done is use the stories as a completely separate thing from my reading lessons. My district has a reading pacing guide that we have to follow. I would teach the same standard for a week or two (whatever was needed). I would do assessments as well to track progress. I do a version of Daily 5 in my room so I would still work with small groups from time to time to work on a skill they may be struggling with. I taught reading whole group and it had nothing to do with the stories really. The stories were just an AWESOME way for me to keep track of what skills/phonics concepts the students were struggling with. It also helped me differentiate for students and ensured students were reading on their appropriate level. This coming year we will be using the stories whole group (but we will not read it every single day) and following the teacher’s manual a little more but I will still pull in better phonics, fluency, and supplemental reading comprehension activities. I will have my students read the story to me each week and if they are struggling I will be able to make anecdotal records. Hope that sort of answers your question! If you have more, let me know! We are a small, private Catholic school that uses RS. Being a fairly new teacher and not having all the components of the curriculum, I am struggling to make sense of this curriculum and utilize what I do have to help my students become better readers. The question I have is: what 5 books are you referring to? Are they decodable readers? leveled readers? Thank you very much! The five books are the five student text books. They are numbered 1-5. They contain the weekly stories.